A funeral service will be held Sunday, Aug. 19 at 2 p.m. at First Baptist Church in Calhoun City. Visitation will be 5 to 8 p.m. Saturday, Aug. 18, at the church. Pryor Funeral Home in Calhoun City is in charge of arrangements. Gov. Kirk Fordice appointed Judge Lackey to the Third Circuit District of Benton, Calhoun, Chickasaw, Lafayette, Marshall, Tippah and Union counties in 1993. He was elected four times without opposition. 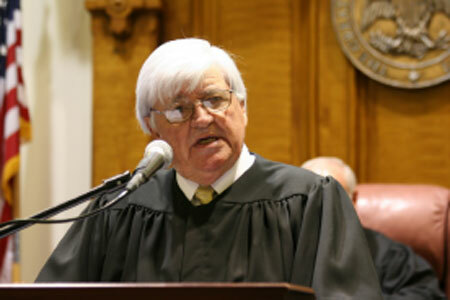 He continued his judicial service after he retired from the Circuit Court bench. Six days after his last term ended, he signed up as a senior status judge. For seven more years, he heard cases around the state by appointment of the Supreme Court, taking over for judges who stepped aside due to conflicts. He handled 45 cases as a senior status judge. Judge Lackey grew up in Calhoun City. He graduated from Calhoun City High School in 1952, and earned a Bachelor of Science degree in business administration from Mississippi College in 1956. He paid a large portion of his tuition by working part time for Deposit Guaranty National Bank while he was a student, and from his childhood savings. When he was in elementary and high school, he ran his popcorn popper at his father’s Ben Franklin five and ten-cent store in Calhoun City. Shortly after he earned his undergraduate degree, he went home to run the family business after his father passed away. Several years later, his National Guard unit was activated. He served in the U.S. Army in 1961 and 1962. He enrolled in law school immediately after he left the Army. He graduated from the University of Mississippi School of Law in 1966. He was soon elected Calhoun County prosecuting attorney, and served a four-year term. He then accepted an appointment for a year as the state’s first public defender. Judge Soggy Sweat oversaw the pilot program at the University of Mississippi School of Law. Lackey and three senior law students represented indigent defendants in the seven counties of the Third Circuit District. The pilot program helped lay the groundwork for the Legislature to give counties authority to designate funds for public defenders. He returned to private law practice in Calhoun City and served as board attorney for the Calhoun County Board of Supervisors for eight years. He was a solo practitioner for 26 years, representing every kind of case that came through his door. He was a member of the Mississippi Bar for almost 52 years, having been admitted to the practice of law on Aug. 21, 1966. He was a former president of the Calhoun County Bar Association and the Third Circuit Bar Association. He was a fellow of the Mississippi Bar Foundation. He was the recipient of numerous honors and awards, including the Supreme Court’s Chief Justice Award in 2008. He previously served on the Board of Trustees of Mississippi College and as President of the Fifty Year Club. In 2009, Mississippi College honored him as Alumnus of the Year. He also was a recipient of the Order of the Golden Arrow. He is survived by his wife of almost 60 years, retired music teacher Helen Rose James Lackey of Calhoun City, and son Kevin Lackey of Ridgeland, director of the Administrative Office of Courts.